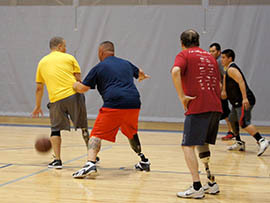 • Meets every Wednesday from 6:30 p.m. to 9 p.m.
• Games played at the Virginia G. Piper Sports and Fitness Center for Persons with Disabilities at 5031 E. Washington St.
• Basketball is free for center members. Others pay $6 for adults and $5 for youths. * Non-amputees are welcome to participate. PHOENIX – Having recently picked up the sport, Steve Barrett, 51, now hits the basketball court every week to shoot hoops with his team and to perfect his jump shot. Preparing for his shot, Barrett dribbles the ball with his left hand, quickly switches to his right, plants his feet, aims and hits the net. After a couple of shots, Barrett walks to the bench to take a break and to adjust his prosthetic right leg. 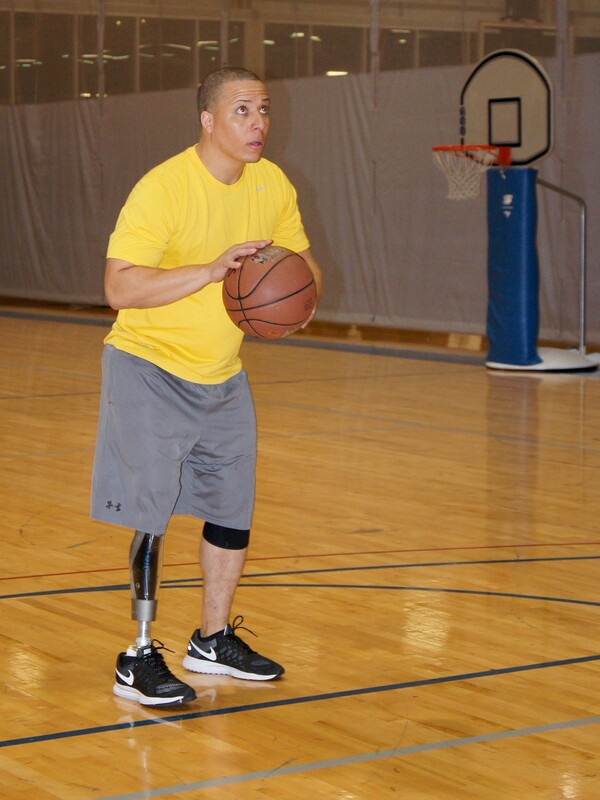 An amputee since suffering a staph infection in 2013, Barrett said he decided to make a change in his life and become more active by joining the Stand Up Amputee Basketball League. Since losing his leg below the knee, Barrett said he has learned how to adapt by spending time with other amputees on the court. The idea of the league began with David Banks, founder of the D Banks Foundation, an organization that helps to provide support for amputees. As an above-the-knee amputee for 15 years and a basketball player, Banks found wheelchair basketball to be the only competitive league for amputees. “There’s got to be other amputees like myself that are higher activity and would like to play stand-up basketball versus sitting in a wheelchair,” Banks said. In October, Banks teamed with the Virginia G. Piper Sports and Fitness Center for Persons with Disabilities, where the games are held, and Touchstone Rehabilitation to create the stand-up league. Gus LaZear, SpoFit’s vice president and general manager, said he immediately agreed because SpoFit works to create different recreational programs for those with disabilities. “The league provides an extra avenue for people to play basketball. They are qualified to play with wheelchairs, but they don’t use them on a daily basis,” LaZear said. Randy West, who makes prosthetics, often attends practice to offer help. He said for athletes who are amputees there is a special type of prosthetic needed. “A foot consists more of a spring and doesn’t incorporate a heel on the foot because you are pretty much skipping that portion when you’re running,” he said. Seth O’Brien, an amputee player, said that although he makes prosthetics for a living he finds time on the court a way to just be one of the guys and not be at work. “It’s a mix of people who are trying to get back to being a competitive athlete and people who are trying to increase rehab,” O’Brien said. Duane Brown, a below-the-knee amputee, said that before heard about the league from his physical therapist he hadn’t played basketball in eight years. Although the league is fairly new, Banks said he hopes it will expand across the Valley and even the country. “The interest and the engagement we’ve gotten so far is that there is definitely a need in the amputee community, so the long-term goal is to establish a national amputee basketball association,” he said. After adjusting his prosthetic, Barrett is ready to get back on the court. He said it takes time to get used to putting weight on his leg to play, but he enjoys it. David Banks said he founded a stand-up basketball league for amputees because wheelchair leagues were the only outlet available to him. The Stand Up Amputee Basketball League plays games at the Virginia G. Piper Sports and Fitness Center for Persons with Disabilities in Phoenix.